From the Rector As many of you already know, sadly my Mum, Phyllis, passed away 28th Jan.. Her funeral took place in Monkstown Parish Church on 31st Jan and I would like to thank Canon Patrick Lawrence for all his kindness and for his generosity in reading the eulogy. I would also like to take this opportunity to thank the people from Tallaght Parish, the wider community, including my clerical colleagues from different denominations for their support, it is much appreciated. As it happened, the Principal of the Church of Ireland Theological College, Rev. Dr. Maurice Elliot was due to preach to tell us about the College on the Sunday after my Mum’s funeral, which was a blessing. Along with the other clergy of the Dioceses I attended the annual Diocesan retreat to Kilkenny and again I would like to thank my colleagues for their overwhelming support at the event and for the cards from laity that I have received since then. On 9th February our confirmation group took part in the Diocesan pre confirmation fun day organised by 3Rock in The Memorial Hall in Terenure, by all accounts a fun day was had by all. Classes continue in the Rectory. On 21st February I attended the 10th anniversary of the ITT College’s Kenyan Project. This project has for the past ten years supported the education of children in the slums of Nairobi. On the 25th there was a planning meeting for the upcoming Flower & Craft Festival of Hands. It was a very positive meeting & I would implore for as many parishioners as possible to offer their own helping hand. People are going to be needed for catering, stewarding, clearing up etc. The festival runs over the weekend of 20th – 22nd September, so no booking of holidays for that weekend! Following the planning meeting I attended the coffee after the local Garda Memorial Mass. May I take this opportunity to wish the readers of this News Letter, a very happy Easter. God bless, William. BAPTISMS On 2nd February Rory, baby son of Amanda Graham and Enda O’Connor was baptised and on Sunday 10th February we had the baptism of twins, Dylan and Ryan Gould, baby sons of Stuart and Emma. Please pray for these babies (and their parents) as they begin their Christian life. CONDOLENCES We express our sincere sympathy to our Rector, William and to Valerie, Amy, Lionel and to the rest of their family on the death of William’s Mum, Phyllis. The funeral took place in Monkstown Church on 31st Jan.
LENTEN SERVICES We began our Lenten services on Ash Wednesday at 11.00am. Our Lenten Holy Communion Services continue throughout Lent on Wednesday mornings at 11am. On Wednesday 6th March with will also have laying on of hands for the sick. In addition we continue with our Lenten Bible Study on Wednesday evenings at 8pm and also our ‘Prayers for the Parish’ on Monday evenings, support is needed at both. DECORATION OF CHURCH The church will be decorated for Easter on Saturday 30th March from 9.00am – 11.00am donations for flowers, greenery and decorations gratefully accepted, why not come along and give a helping hand? You will be warmly welcomed! DATES FOR YOUR DIARY: Don’t forget Mothering Sun, 10th March. A chance to show your Mum how much you care! The clock springs forward: EASTER Sun 31st March. Take note & don’t arrive late for Easter morning service! EASTER VESTRY The Easter Vestry (AGM) will take place on Sunday 14th April at 11.30pm following a shortened 11am Morning Prayer Service. This is an opportunity for you to come and see how the parish is doing. It is also an opportunity for you to have the chance to elect our Select Vestry (new committee) who run the parish on your behalf. GIRL’S BRIGADE Some of you may already have heard but our Girl’s Brigade Captain Carol Fox is standing down after 40 year’s of loyal service to the 26th Company, St. Maelruain’s, Tallaght. The Select Vestry are making a presentation to Carol at the Girl’s Brigade Display on 27th April. If you would like to contribute please contact the Rector. Thank you to Carol for all the work, care and attention that she has given to the Company over the years, she has been a true servant to Girl’s Brigade. PORCH We would like to thank Paul Furney (who runs an advertisement in the Church Review for ‘Paul Furney Plastering and Painting Service’) and his brother Gary for painting the porch of the Church. They lost their Mum, Jean, not so long ago so it was a very generous gesture. FESTIVAL OF HANDS. SEPTEMBER 27th - 29th ST. MAELRUAIN’S PARISH We had a meeting in the hall on Monday 25th Feb. when we invited anybody that was willing to help organise the festival to come along. We were heartened by the turn out and would like to thank everybody for their support. It's not too late to offer your help, as there is such a lot to be done. We now have a list of leaders and some helpers who will be asking for your help in the next few weeks, the more helpers we have the better it will be. This festival is being advertised nationwide and has the backing of such organisations as South Dublin Tourism, who will be working with us to put out a promotional package for our Festival and Tallaght, so we are hoping and expecting a lot of visitors. 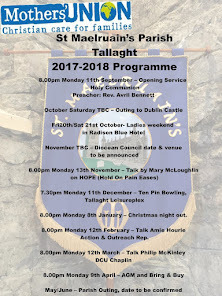 This Festival has huge potential for St. Maelruain's and for the area of Tallaght and we are appealing to you all to please come on board. It's a real opportunity too, for us all to get to know one another and share the gifts we can bring to this event. Janet Edgely held a coffee morning and produce sale in her home on 23rd February and managed to raise in excess of €900! She would like thank everybody who came along and supported the event, it’s a great start in raising funds to cover the costs of organising the Festival of Hands. WHIST DRIVE The next Whist Drive will take place on Mon 18th March at 8.00pm in the Small Hall, all welcome! COFIRMATION Confirmation will take place in Zion Parish Church on 21st April at 3.30pm. BOYS BRIGADE Two members of junior section took part in the junior section quiz in Clontarf parish. Well done to Callum and Kyle who came second with another boy from Dundrum who helped make up the team and enabled our members to take part. We are at present planning an event for junior and company section for Good Friday. The boys are continuing to work on the display items. The display this year will take place on Saturday 20th April. 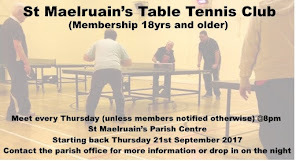 TABLE TENNIS Table tennis runs from 8pm on Thursday nights in the Parish centre. We are actively looking for new members of all standards, as our numbers have dropped dramatically over the last year. Our club is an informal one, with an emphasis on fun and enjoyment. Anybody, over the age of eighteen is welcome to join us. MOTHER’S UNION We extend our deepest sympathy to Rev. William and his family on the recent death of his beloved mum, Phyllis. Our thoughts are with him at this time. A sympathy card was sent to him on behalf of our group by the Secretary. We had a presentation by Barnardos on “Working in the Community” detailing their work with children running breakfast clubs, after school clubs, and visiting schools to speak on bullying, suicide, etc.Barnardos depend on donations for 40% of their funding. Our donations from the meeting of €94 were gratefully received. On Monday 11th March at 8pm we will have a talk by Guide Dogs for the Blind. We will also decide where we will go for our outing on Saturday 18th May. TEA ROTA: Regina Donoghue/Vivienne Bright SAOIRSE: March donation: SUGAR and April: TEA. Mon 8th April: AGM/Bring & Buy Sale. Suggestions for meetings for 2013-2014 will be gratefully received. Fancy some knitting? 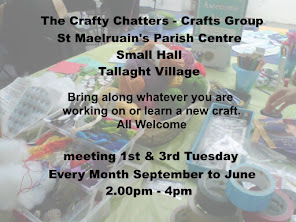 If so please contact Regina Donoghue who is looking for tea cosy knitters for the Flower Festival to be held in September and will give you a pattern. 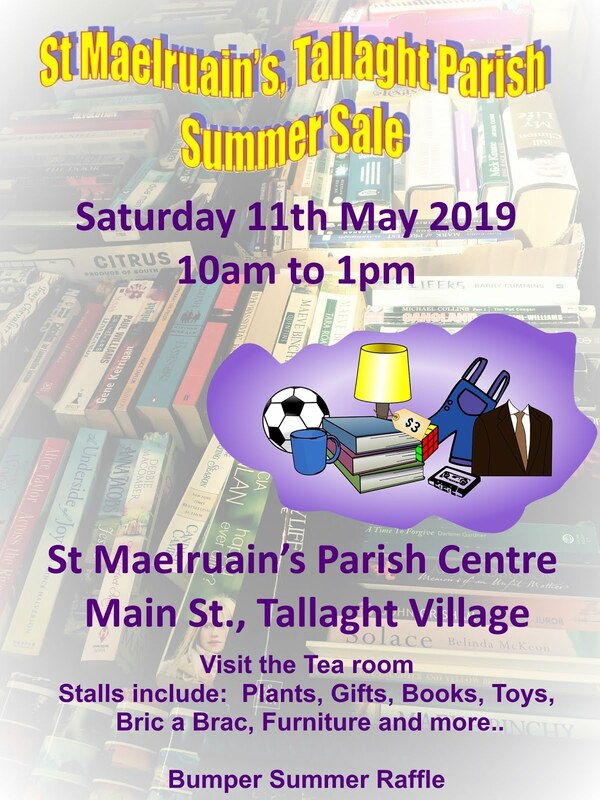 THE SUMMER SALE The date for the Summer Sale had been set for Sat 25th May. Please do what you can to make this event a success, donate items for the stalls, buy, sell raffle tickets, volunteer to help out and come on the day and bring your family and friends! Contact Ronnie Scott, sale co-ordinator 086 804 5090. 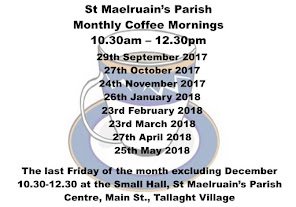 PARISH COFFEE MORNING No Coffee Morning in March due to the fact that it falls on Good Friday. We will however be back again on Friday the 26th April, 10am - 12noon, in the Old Hall. Hope to see you all then.